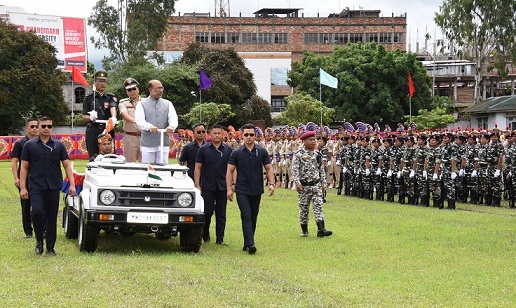 Manipur Chief Minister Nongthombam Biren Singh hoisted the tricolour amidst tight security at 1st battalion Manipur Rifles ground on Wednesday on the occasion of 72nd Independence Day. Speaking on the occasion, the chief minister urged the people of the state to join hands in protecting the unity and integrity of the state as well as the country. He said that the Manipur Legislative Assembly had renewed its stand to protect the integrity of the state by taking another unanimous decision in July this year. He expressed hope that the Centre would certainly consult the states before taking any decision regarding fulfillment of demands of the Nagas. Regarding the present unrest at Manipur University, he expressed hope that it would be amicably solved within a few days. He said that the NDA Government at the Centre had made outstanding progress in diplomatic relations with different countries apart from bringing many developmental and economic changes. The land route to Myanmar was formally opened on August 8 this year. Passing of OBC Bill 2017 and National Sports University Bill, 2018 could be mentioned among the latest positive developments made possible by the Central Government, he added. Stating that condition of Imphal-Jiribam sector of NH-37 has now improved considerably, he said Makru and Barak bridges are likely to complete by March next year. 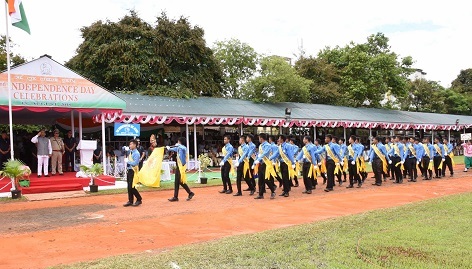 This year’s special attraction of the march past was participation by a contingent each from 15th Mahila IRB, Nagaland and 9th Battalion State Armed Force, Madhya Pradesh. Eight band platoons of different security forces, Home Guards, Manipur Fire Service and Sainik School also took part in the march past. Later, the Chief Minister also decorated three police officers with President’s Police Medal for Distinguished Service and presented Police Medal for Meritorious Service to 13 officers and police personnel. Besides distributing prizes for the Swachh Survekshan 2018 for the cleanest towns of Manipur in North East region (population less than one lakh), he also handed over the State Level Swachhata Award, 2018 in the day’s event. Special open defecation free award was also conferred during the occasion. Manipur Pradesh Congress Committee also observed the day by holding a gathering at the Congress Bhavan in Imphal on Wednesday. Independence Day celebration was also held at the different district headquarters of the state. Meanwhile security measures have been beefed up in the state in view of the total shut down called by CorCom, Coordination Committee of insurgent groups in Manipur from 1 am to 6.30 pm of August 15 to boycott Independence Day celebration in the region.